If your loved one has passed away then you have other things to deal with other than paperwork. But it is sometimes important. One such document is Employee Death Benefits Letter which is an easy way to get information from former employer about the benefits of the deceased employee’s beneficiaries. The purpose of an Employee Death Benefit Letter is to formally request about the benefits you may be entitled to. In this post, we have come up with Employee Death Benefits Letter sample to help you have an easy to use death claim letter format. Use this sample death benefits letter to employees to create your own to seek benefit details from employer. In case when you need information on benefits from employer of the person who has passed away. Sometimes you are unaware of the insurance policy and other benefits offered by the company to your loved ones and when the person is no more, by writing a death claim letter to the former employer, you can get complete information on it. 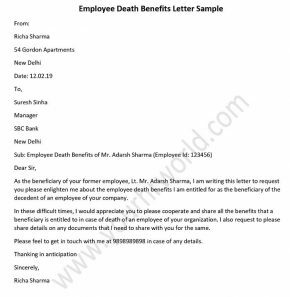 As the beneficiary of your former employee, Lt. Mr. Adarsh Sharma, I am writing this letter to request you please enlighten me about the employee death benefits I am entitled for as the beneficiary of the decedent of an employee of your company. In these difficult times, I would appreciate you to please cooperate and share all the benefits that a beneficiary is entitled to in case of death of an employee of your organization. I also request to please share details on any documents that I need to share with you for the same. Please feel to get in touch with me at 9898989898 in case of any details.